Sacrifice, suffering – and a gradual, hard won ascendance are part of the dual Jewish and African American histories. Is it possible to blend these two cultural stories into a simply wonderful Passover story? You bet. If your name is Patricia Polacco, and you’ve had some hard-won hurdles of your own as a child growing up, then overcoming hardship is a part of the literary picture book history of your own life – and a modeled resilience in the face of them. The sharing of generational life experience in her stories is never preachy or boring. It peaks the readers interest as it only serves to draw the two generations closer as one learns from, and informs the other – as it should be. So it is here, with Mrs. Katz, a lonely and lovable Jewish widow, and her friendship with the young African American, Larnel. She is in need of a friend and companionship. He provides her with both, beginning with a small cat that needs a home. A bargain is struck..she will take the cat she names Tush, if Larnel will sign on as co- caretaker with her. Done. And what proceeds from that, is a life long lesson in, well, LIFE. She shares with Larnel her life in Poland, her Jewish heritage, her love for her deceased hubby, Myron, and the history of the seder feast that precedes Passover. Tush, the cat, may be the impetus for their initial connection, but she only provides the bridge for two people of different generations AND cultures to see what they share, and everything builds from there. I think young readers will love Mrs. Katz, her homey goodness, sprinkled liberally with small Jewish words of endearment such as bubeleh, (term of endearment for a female) and bubee (grandmother), plus Jewish vocabulary such as chuppa, kugel, kaddish, shalom, and matzoh. From finding a home for a small, homeless cat named Tush, Larnel and Mrs. Katz share a wonderful friendship that grows to eventually include both his family and later Larnel’s own children. It’s funny that not just a feline named Tush is looking for a home and companionship. Humans have just as great a need here, too. But first, Mrs. Katz and Larnel find themselves sharing a series of events that include Tush’s disappearance, rescue and a seder table. They find in each other what every one of us is looking for – acceptance and love. And something more emerges here. I think “Mrs. 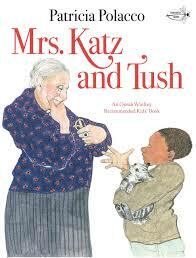 Katz and Tush” may bridge religious lines of demarcation for young readers too. And I’ll tell you why I believe it to be so, with one very minute, but telling piece of evidence. In the secondhand copy I am holding, there is an inscription that reads, “Merry Christmas to Dom and Nick from Matt and Jake.” Wonderful!